Millions of people, post hundreds of millions of social media images. Every. Day. But only a few (relatively) inspire you enough to stop and notice rather than scroll on or leave entirely. Because too many images are low-quality, unappealing, booooring or just not worth sharing. But hey, good for you. Because there’s no need for any of this. Not with so many great tools available to you. 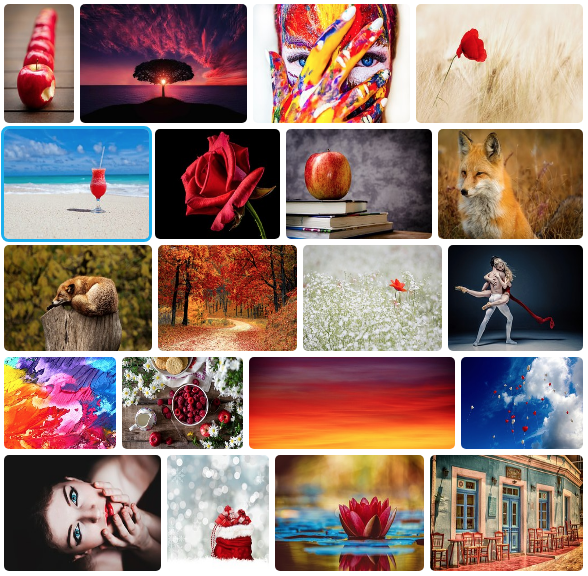 Building a library of high-res, eye-catching, notable, shareable, and beautiful images is easy. And cheap (or free). Let’s have a look at 16 great ones. An online web app to design graphics for projects, big and small. No design or editing experience required. And, it’s the most versatile tool out there (though flexibility comes with a cost—many of the other tools are easier to use). Create excellent looking graphics for your social media posts. Edit photos, create infographics, build graphs—fairly quickly and easily (sometimes versatility makes things a little harder to do). Choose from a ton of ready-made layouts. I created this a while back, summarizing an article on the web (actually, I created a whole blog, visually summarizing books, articles, meetings, and movies). Start for free. Pay for more services, if/as you need them. 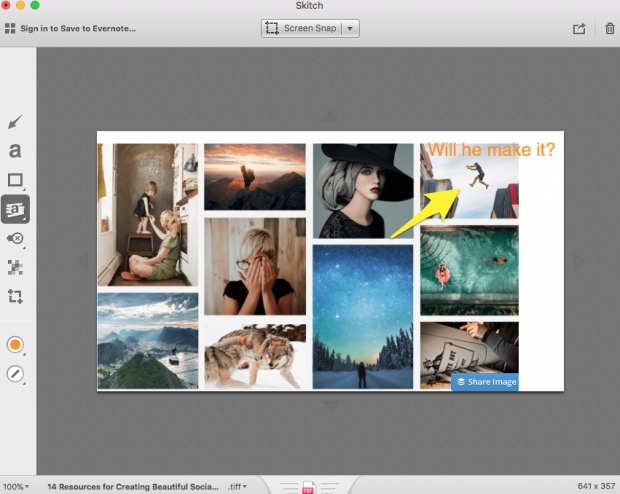 Canva has preset image sizes for Twitter, Facebook, and Pinterest. This is important since each platform has settings and limitations for images. Be the designer you never thought you could be. BeFunky helps you… be funky. 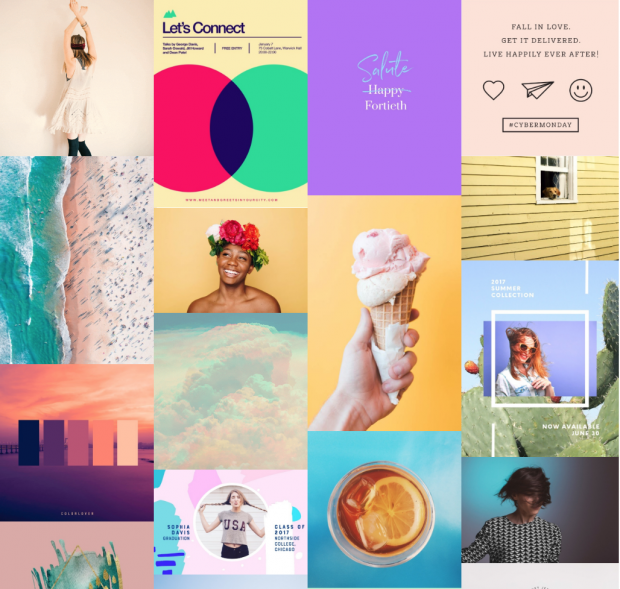 Like Canva, it’s a one-stop-shop for creating graphics, and collages. It’s easy. It does a whole lot. So you don’t have to (or are unable to do). Need to add effects to your images (like make it cartoon-y)? Or assemble them into a funky, yet professional, collage? Fix images with issues like over-or-under-saturation? BeFunky will help. Then, pick a layout for your social media needs. Like headers, blog resources, or a small business template. All done online, without downloading a thing. Except for your finished and polished images. 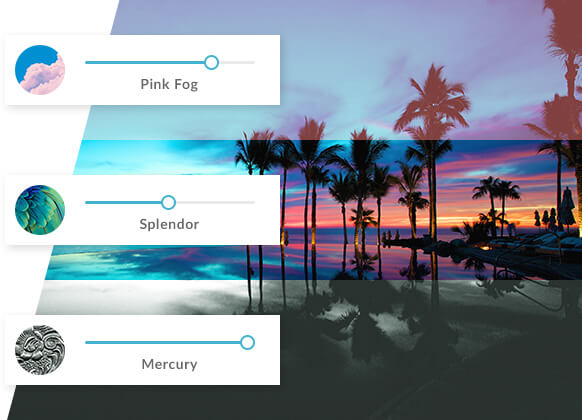 Get 125 digital effects for free. 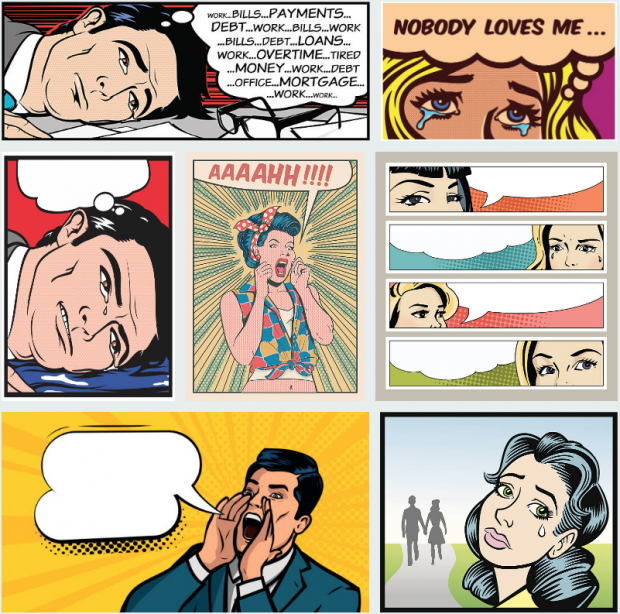 Or, pay a monthly fee to get high-res and other crazy-cool image effects and templates. A digital warehouse of ready-to-use design assets assembled from tens-of-thousands of independent creators. Graphics, fonts, website themes, photos, mockups, and more—you can find it all in Creative Market. Because all the hard work is done for you. Everything is assembled to look and work well together. Browse what they have, enjoy what you see, pick what works best for your social media images and posts. There’s a lot to choose from. Don’t get overwhelmed. But if you do, start with their free stuff. They offer six free products every week, so you can build up your own collection. Like this one (of typefaces, graphics, fonts, patterns, mockups and clipart). Has your creative flow runneth dry? If so, inspire yourself with Made with Creative Market. There’s a place for everything, including stock images. Maybe the big companies can shoot, draw, or create their own, but for the rest of us, flock to stock. But try to be non-mainstream about the ones you select. Because they’re boring (which you don’t want to be). This is a crowded field. I’ll share a couple I think make stock rock. A collection of over 90 million high-quality assets to use in your social campaigns. For photos, illustrations, videos and templates. Because you’re a professional digital marketer. Not a professional illustrator, photographer, or videographer. Better you license what they’ve done to accomplish what you need for your social campaigns, right? Even better, use Hootsuite to do all of that in one easy-to-use dashboard. To find plenty of photos and drawings that look great, yet not so mainstream. It’s my go-to site, for my stuff and for my clients. It’s easy to find images and save to a ‘board.’ I keep a board for each project to verify and create a consistent design language for any new website. Do the same for your social campaigns. Here’s a search results for “retro” and “cry” (for a client piece I’m doing). A giant and growing collection of free animated gifs. To spice up, excite and wake up your social audience. Consider this a part of building your brand voice. As with all content, images are meant to enhance the words. A little motion makes it more memorable. Though use sparingly, otherwise it distracts rather than enhances. Do some Giphy searches. Enjoy the chuckles. Make it so your audience does, too (with a purpose). An online app to create infographics and reports. Including charts, maps, graphics, and dashboards. Using data in your social posts builds credibility with your audience. You may not need a full infographic. Fine. Create charts and graphs to make your points well-understood, with over 35 chart types to choose. Working with data can be tricky. 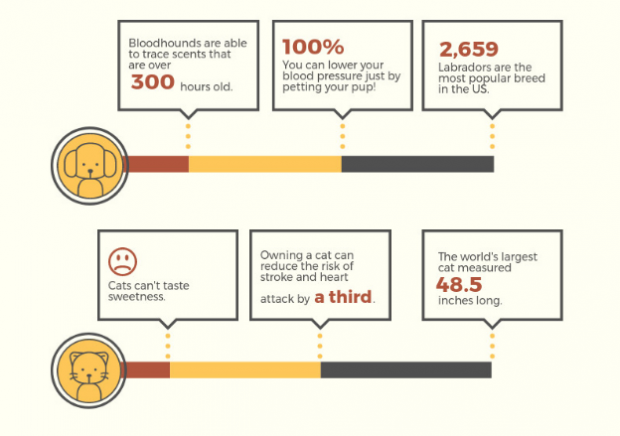 Infogram makes it easy and painless. Fun, too. Start for free. As you get to be a pro, consider one of their three packages, from $19 to $149 USD a month. 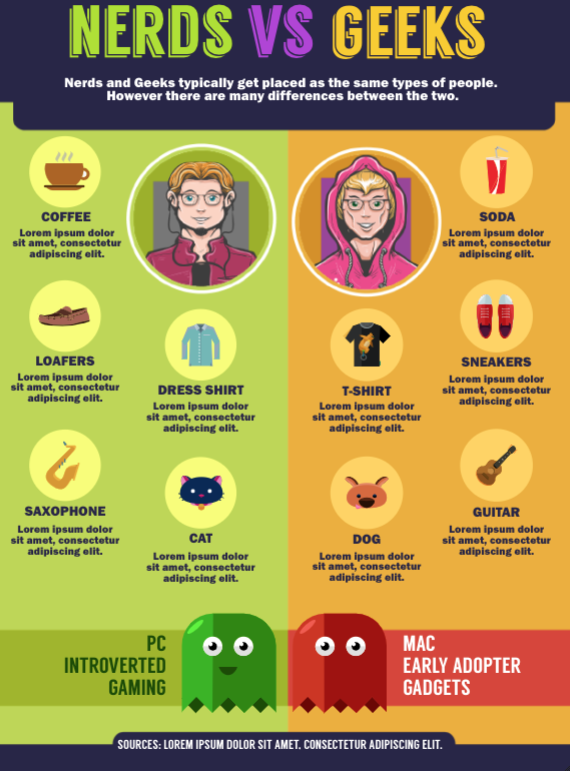 Another way to create infographics, presentations, and printables. Preview it. Refine it. Play with it. Preview it again. Once you get good, create your own template to keep a consistent look for your campaign(s). With three packages, from $12.50 to $82.50 USD per month. The same as the previous two apps above. It’s got a cute name. It has a set of graphics different from Infogram and Piktochart. Good to have options for your visuals. A social media image editor and library that you can use when creating and scheduling your posts across networks. To write your words, then enhance them with pictures. All in one place, within Hootsuite Composer. All the usual suspects like resize, crop, turn, transform, filter, and more. Want to post your piece on Facebook or Instagram? Select one of the recommended image sizes. Add your logo or watermark, too (coming soon). No need to write here, edit there. Do all this from a single platform. It comes with whatever Hootsuite package you’ve signed up for. 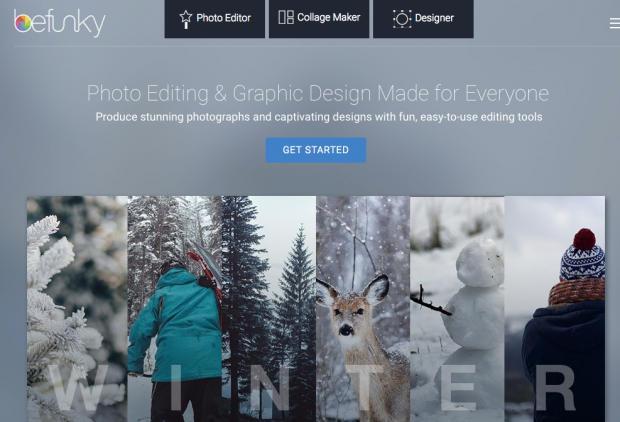 An online, social media image editor created for marketers, bloggers, and small businesses. It’s easy to get started, easy to use. With a zillion choices for images, backgrounds, icons, quotes, and templates. Using Stencil is simple. You’re presented with a canvas. Select photos, icons, templates and quotes to place on it. Drag, crop, resize, tilt, filter, set transparency, change colors, change fonts, add a background. I created this one in 45 seconds. Select a pre-sized format to look perfect on Facebook, Twitter, Pinterest, or Instagram. Then, preview it, download it, share it, save it, or schedule it. Start creating for free. Then pay $9 or $12 USD a month for more visual goodness. A mobile app (for iPhone and Android) for adding text, overlays, and blending colors for images. Because all you need is your phone, app, and thumb to wow your audience. 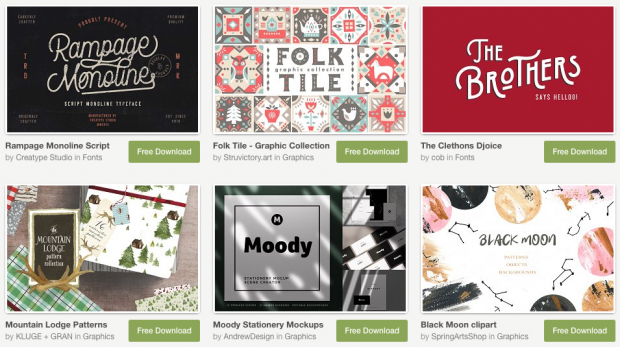 Choose from a ton of assets to support your brand and message. Even more, learn from their tips, trends, and insights for standing out from the crowd. Feeling inspired? No? You will when you start using Over. Kind of hard not to. Now… go blend a cloud, make an ice cream cone drip, or put yourself posing on top of the Burj Khalifa. An online app to perfect or radically change your social media photos. Because it’s online, nothing to download or install. And… with a boat load of features to create the effect you were looking for (or just stumbled on to). 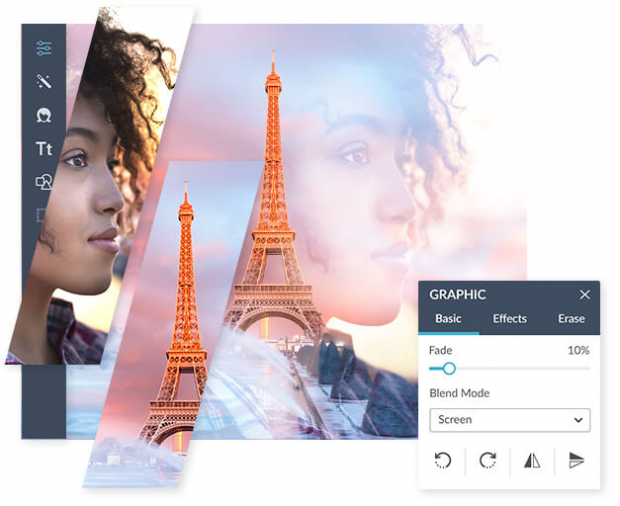 Start right away to blend colors, create double-exposures, add filters, and all the other editing features. Like the other social media image tools in this roundup, use a template or start with a blank slate. From $7.99 to $12.99 to $39.99 USD per month. An online web app to create a mockup. Because sometimes, just a screenshot of your website or app won’t give the reader the right information. PlaceIt helps you quickly generate demos of your website or product being used in real life. For example, take a website screenshot, then put that screenshot on someone’s Macbook screen with PlaceIt. 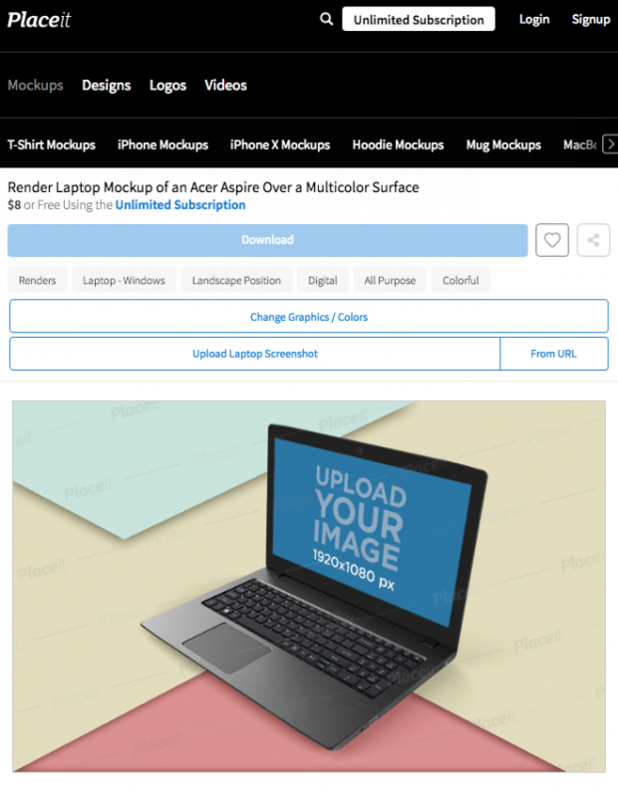 Pick a mockup template—there’s tons to choose from. Then customize it. Placeit has some brains, too. It’s easy to adjust the things that make sense for that template. 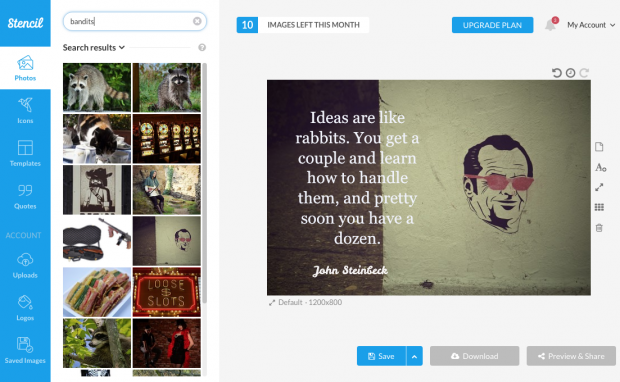 PlaceIt is free for low-res images, $29 USD a month for hi-res ones. Skitch is an application to add any comments to any visual. It’s an Evernote product, available for Apple products. To easily and visually convey your ideas to others. Got a webpage, or app window you want to comment on? Or need to show someone what’s not working on your screen? Either way, take a snapshot of your screen. Use arrows, text, stickers, and a handful of other tools to make your point. Pictures + words—they go so well together. The more senses you use, the more sense you’ll make. The right social media tool for the right social media job, right? As you can see, there’s many of them. I use a bunch myself. Sometimes it depends on the job, for sure. Other times, it depends on my mood. I like having options. Got your social images ready? Use Hootsuite to share them with the world. Take or upload a photo, customize it, then post or schedule it to the network (or networks) of your choosing. Try it for free. 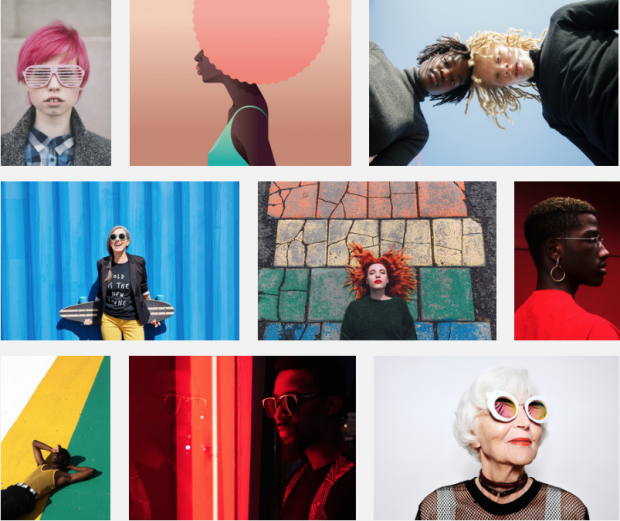 The post 16 Tools for Creating Quick and Beautiful Social Media Images appeared first on Hootsuite Social Media Management.